This property is a 2-minute walk from the beach. 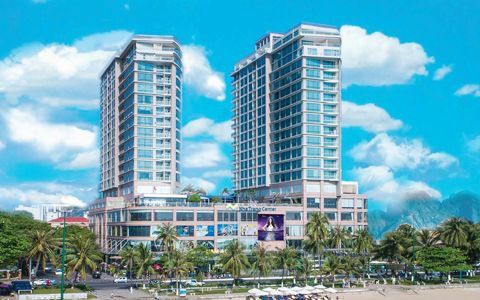 Located near the shore, Diamond Bay Hotel is set in Nha Trang, just 200 m from Khanh Hoa Museum. Featuring an outdoor pool, guests can choose from an array of international and local cuisines, or simply sit back with a glass of beer at the bar. Nearby attractions include Alexandre Yersin Museum, 400 m away and Nha Trang Catheral, 900 m away. Cam Ranh International Airport is 27 km from the property. Featuring neutral and earthy decor, every room at this hotel is air conditioned and is equipped with a flat-screen TV. Some units feature views of the pool or city. En suite bathrooms are fitted with a shower or bathtub and are equipped with bath robes and slippers for comfort. Guests can get assistance 24 hours a day from the bi-lingual staff, who can help with check-in/check-out, currency exchange, luggage storage and even tour and ticketing services. Havana Nha Trang Hotel offers modern accommodation just 5 minutes' walk from 2/4 Square. The sandy beach is just across the street.